“Her given name was Patience. Her schoolmates called her Pat. is where one day she sat. but she did love cottage cheese." I’ll resist the urge to type this whole thing out for you guys and just say, "Happy Book Birthday," to Miss Muffet or What Came After, written by Marilyn Singer and illustrated by David Litchfield. This is a fractured fairy tale like none other! 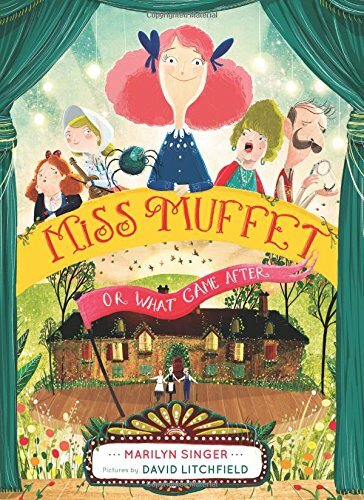 In this book, the story of Miss Muffet is re-done as a musical…and the drama is HIGH. The characters include a pushy mother, an entomologist father, an ambitious fiddler (Miss M. herself), Bo-Peep (yes, her), a talking spider, and many more familiar friends. They whisk us away on a fantastic quest and change everything we though we knew about the timid heroine. There could not have been a better illustrator for this complex tale than David Litchfield. 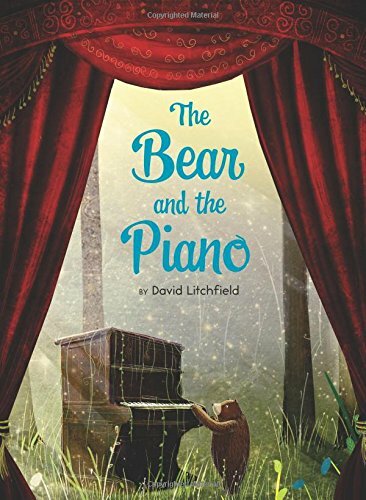 I’m a HUGE fan of his debut picture book The Bear and The Piano, and this maintains his reputation for gorgeous, light-filled spreads, lovable characters, and the perfect mix of textures. Look closely at the cover, and you can even see his signature curtains framing the scene.